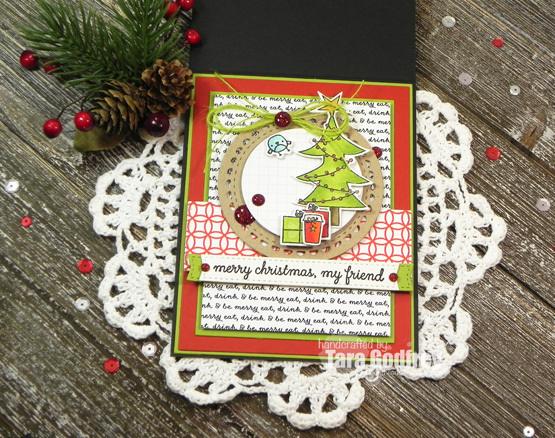 Inking on the Edge: Reverse Confetti - Sunday Stamps Challenge # 168 - Christmas Cheer! Reverse Confetti - Sunday Stamps Challenge # 168 - Christmas Cheer! Merry Christmas, stampin' friends! I hope you all have a wonderful Christmas day filled with good food and good cheer spent with family and friends! I'm stopping by to share my SSC168 card that I made with Reverse Confetti Christmas Bear Stamp set and Christmas Bear Confetti Cuts. 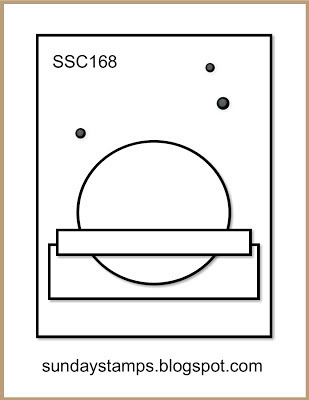 I used the fab sketch that they have at Sunday Stamps Challenge - SSC168! I used Reverse Confetti Card Stock in Brick and Lime Green and the patterned paper is from the RC Holly Jolly Quick Card Panels. I used the Lacy Scallop Frames Confetti Cuts and my Rectangle STAX Set 1 Die-namics to cut out the centre of the panel to create the frame. I also used the Lacy Scallop Circle Confetti Cuts for the focal panel and popped up the Christmas bear and tree up on the panel with adhesive dots. I coloured the Christmas bear and other images from the Christmas Bear Stamp set with my Copics, cut them out with the coordinating Confetti Cuts. I replaced the present that the bear holds with a take-out coffee from the Coffee and You Stamp set. I stamped a sentiment from the Christmas Cheer Stamp set on Reverse Confetti Cloud White Card Stock cut with the stitched fishtail banner Die-namics from Blueprints 2. I embellished with some lime green hemp twine and sparkly red YNS Gumdrops. I finished the inside of my card too...I added a few more Copic coloured images on the Lacy Scallop Circle panel and another sentiment from the Christmas Bear Stamp set. 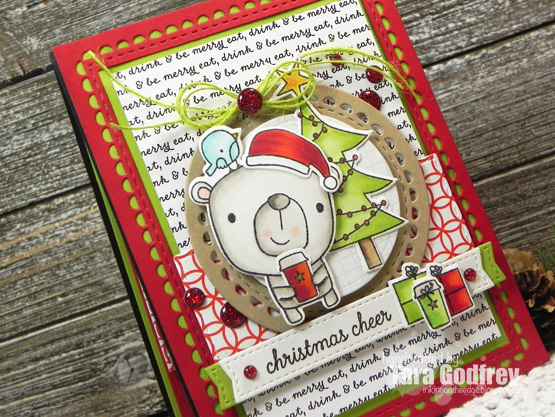 Thanks SO much for stopping by and havin' a little look at my Reverse Confetti, Christmas Bear card for the Sunday Stamp Challenge # 168. Super cute card! Love all the layering you did. oh my, this is simply adorable!! I just love the images you used and the papers are perfect! Wonderful use of the sketch! Lovely whimsical images, and beautiful coloring! I love all the layers you added to your card. Thank you for joining Sunday Stamps this week. Wow! Where do I begin? Such a fantastic card! That little bear is the cutest and the fact that he's holding a cup of coffee makes him even sweeter. The inside of your card is just a beautiful and the front...so much care and attention to detail here! Thanks so much for sharing with us at Sunday Stamps this week.